Just a quick tip for today! The best way to go out and improve your photography is to practice and shoot a lot! This helps you learn your camera and practice making images. Then when you are done, analyse your photos carefully! How do you think the image stacks up? How do you know if you are getting better as a photographer? This is where your visual library comes into play! Put simply, to develop and build your visual library, you have to look at lots and lots of other photographs! Think of it as experiencing lots of different situations. This will help you in analysing your own images. I spend an awful lot of time at 3 main sites on-line looking at pictures. The primary site I use is http://500px.com. This site truly has some of the best photographs I have ever seen from photographers (amateurs and pros) around the world. I often find myself spending any where from just a few minutes to an hour or more, just looking at photos in the popular category on their home page. I also keep an eye on what other photographers I follow on 500px, like as photos and also comment on themselves. When looking at images there, I try to determine what I like about the photo. How did they do the composition, where is the light coming from, and what is it about the photo that I really like? Ask yourself if they followed some of the basic composition rules or did they break them and how does it work? You can also search the site for images in a specific category or by keywords. I often tag images as favourites so that I can go back and look at them again. I also look at images that I am not to fond of then and try to determine why I don’t like them. You can sign up for a free account there and like and favourite images as well as follow and comment on photos. Even if you don’t plan on uploading images, having an account there is well worth it. They also have apps for IOS and Android devices so if you find yourself with a little downtime somewhere you can pull out your phone or tablet and look at some pictures. 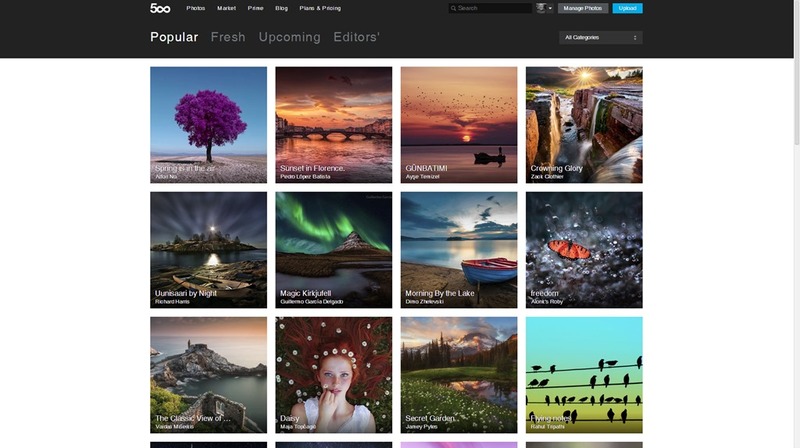 If you sign up for an account or already have one please consider following me at 500px. http://500px.com/SKennedy. The last primary site that I use is Flickr, http://flickr.com, although I feel that it is not really as relevant as it once was. They still offer groups there so if there is a type of photography that you are interested in, you can look at images in the group’s pools. Like the other two sites, you can like images, favourite them or follow other photographers and see what they are shooting and uploading on a regular basis. My Flickr page is at http://www.flickr.com/photos/sysguy/. You can also sign up for a free account here. Both Google + and Flickr also have free apps for smart phones and tablets that allow you to view images, comment and mark images as favourites. There are other sites that I also spend time looking at images at (like Instagram and others) but the three above are my primary sources for building my visual library. Another way of building your visual library is to find a photographer that you like and follow them on social media, analysing their work and their postings. I follow photographers like Joe McNally, Moose Peterson, Peter Read Miller, Jeremy Cowart, Joey L, Colby Brown to name but a few. I follow most of these photographers on Twitter, Facebook, Google+ as well as their own websites. By looking at 1000s of images, your own visual library will be developed and then when you get out and are taking pictures, slow down and think about what you have seen in other images and apply what is best for your situation. This can be a guideline as to how you want to take your own images. Then after you have taken your images review them comparing to what you have seen and stored in your own visual library! After looking at lots of photographs you might want to go back and look at some of your earlier work as well to see how you have progressed. As I continue to build my own visual library, I look at some of my own earlier work and say to myself “What was I thinking when I took that?” This is actually a good thing, it shows that you have improved your own eye and helps you recognize areas where you may have been previously weak! While you still have to take the time to learn via other means (shooting, reading, attending workshops), looking at lots of images and building up your visual library will help you visualize what you want your photograph to look like before you push the shutter button. PS. Just a little bonus tip.. I also use the sites above to research areas and locations I will or may be shooting in. I search for the location I will be in and see what other photographers may have shot in the same place. This entry was posted in General, Instructional, Tips and tagged 500px, Flickr, Google, Images, improve, library, photographs, Tip, visual, visual library. Bookmark the permalink.